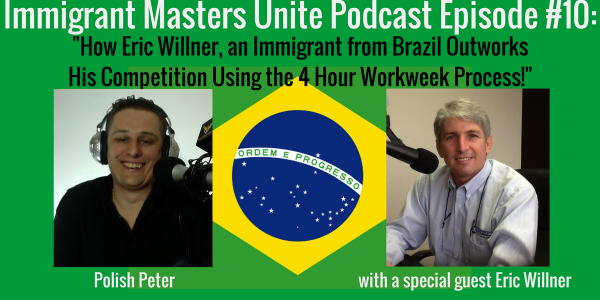 IMU 010: How Eric Willner, an Immigrant from Brazil Outworks His Competition Using the 4 Hour Workweek Process! | Immigrant Masters Unite Podcast: Transform Your Business, Life and The World Around You! In this episode 10, I have another great treat for you, an Immigrant from Brazil, Eric Willner. Eric is a host of South Florida’s oldest and longest continuously running radio show about real estate called “The Real State Show.” The show focuses on the best ways to invest, own and operate real estate. It’s heard live Monday through Friday locally on AM 740, FM 96.9, and iHeart Radio. Eric take on being an immigrant in United States and how he uses it as an opportunity to not only invest in real estate but to build a very successful business. What the phrase “I’ll outwork you” means to him and how he uses it to win in business and in life. How he uses the “4 hour workweek” process to his advantage and his interpretation of it. Once you hear his interpretation of the 4 hour workweek, you’ll never look at that book same way again.